JerrisApparel Flower Girls Unicorn Costume Pageant Princess Party Dress (5 Years, Pink) | What Should I Say? 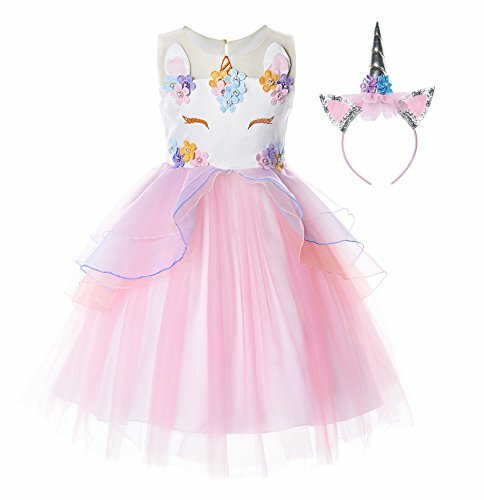 Flower Girls Unicorn Costume comes with chic unicorn pattern and multicolor floral decoration, especially the unicorn headband, it is made by hand and the headband is exceptional quality. This Flower Girls Princess Costume is ideal for many occasions, such as photo shoot, princess, wedding, birthday party, festive party, daily wear, carnival etc. Get one for your girl. 1.There is 1-3 cm differences because of different measuring methods. Please check the size info carefully. If you have any questions about this product by JerrisApparel, contact us by completing and submitting the form below. If you are looking for a specif part number, please include it with your message.